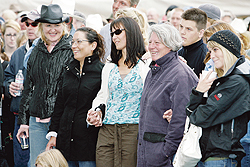 At the heavily attended memorial service for Mark Fisher at Bellevue City Park Friday, June 9, Fisher's widow, Danette, second from left, surrounded by supportive friends, smiles as she listens to one of the many amusing stories friends and family shared about her late husband. Approximately 1,000 people turned out to pay respects and bid farewell to the owner of Mama Inez, a popular Bellevue eatery. Tall tales mark passing of ?righteous cowboy? Art and the ?Love Factor?